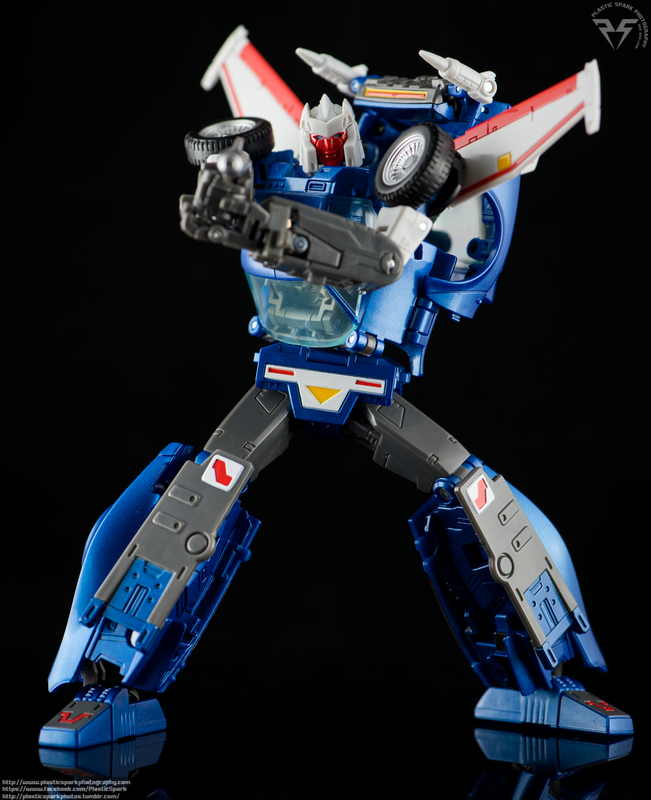 MP25 Tracks is one of the first MP releases since Shogo Hasui left the line and while there are some obvious differences in design I still feel it’s a solid entry in the Masterpiece line. He’s got some flaws that I personally think could have been overcome in development and I am a little sad to see such avoidable issues with a Masterpiece figure but it’s not all doom and gloom. Read on for some more in depth thoughts on the vainglorious Autobot warrior Tracks. 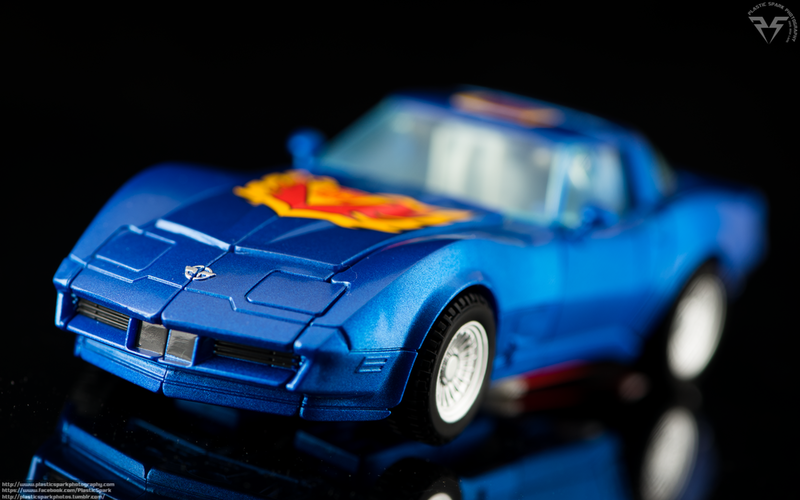 Tracks’ vehicle mode is nothing short of gorgeous. 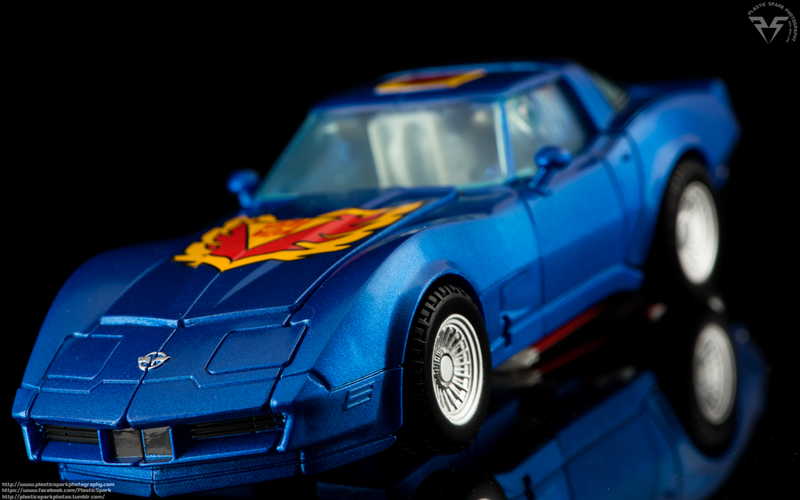 Combining a beautiful metallic blue paint with the sleek smooth lines of one of the most beautiful cars in existence, the Corvette Stingray, makes this Autobot a real showstopper when it comes to vehicle mode. Much like Wheeljack and other MP cars his wing mirrors come separate on a small sprue, you get 2 sets and they peg in to small holes in the sides of the doors. One of my sets had some of the blue paint rubbed off the rear of the mirror, but the other set was without issue. A nice touch is that they painted the front of the mirror silver as well. Tracks’ wheels are painted in a brilliant silver with highly detailed rims and nicely sculpted tire treads. The tires are plastic which I know is a bit of a letdown for some people but personally I’m ok with it. They don’t pick up dust the way rubber tires do and I don’t have to worry about the possibility of them cracking or degrading over time. 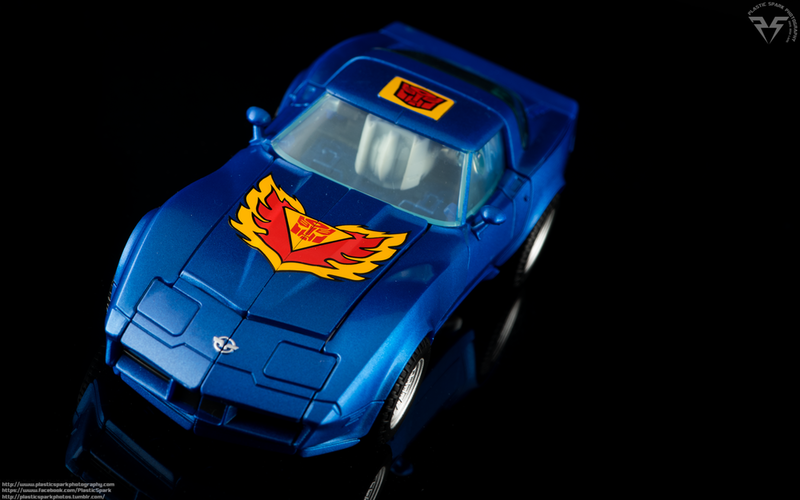 Almost every little detail on Tracks is painted including his front grill, tail lights, and the tiny Corvette logos adorning the front and rear of the vehicle. The rear license plate area is well defined and just screaming for a Reprolabel license plate. Another really nice touch is that you can actually lift the hood and there is a faux engine underneath, molded on to what will become the rear of Tracks’ legs. The alt mode isn’t entirely without its flaws. The rear of the vehicle has a large amount of visible kibble under the vehicle due to Tracks’ wing pack and thrusters hiding out under there. From the rear it’s easy to dismiss the grey plastic of his thrusters as bits of the exhaust system but there’s no mistaking the giant white wings hanging out on the underside of the car. His head is also plainly visible in the cab of the vehicle through the windshield and side windows. I almost wonder if it would have been a better move to paint the windows solid black instead of leaving them a clear plastic. The front left quarter of mine doesn’t line up perfectly with the windshield so there is a tiny gap. It isn’t noticeable from the other side and he still sits flat on the ground. I haven’t been able to figure out what is causing the gap. I’m sure this is just an issue with my copy but it may be a more widespread issue to keep an eye out for. Tracks is packed in alt mode in the box so if you have a chance to inspect your purchase before buying I would recommend just taking a quick look. Tracks’ alt mode is unique in that he has a secondary flight mode for his car form. 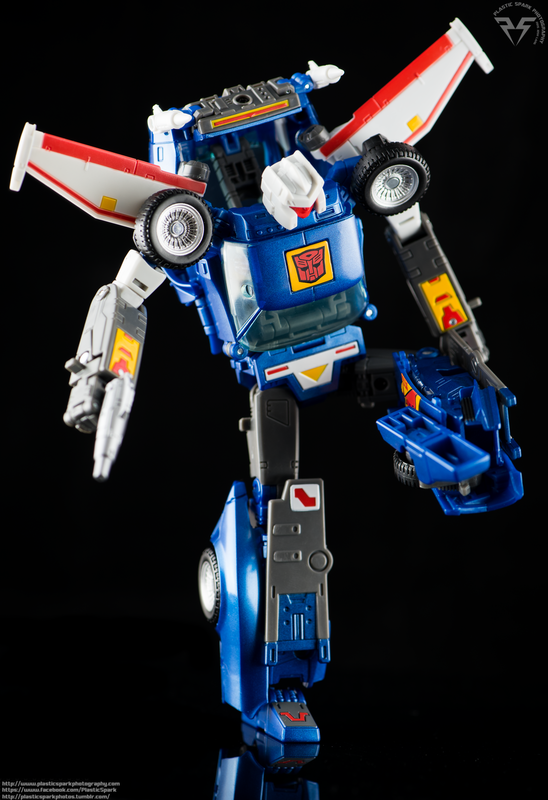 Transforming tracks into his flight mode does require a bit of maneuvering to remove his arms and wings from the rear of the vehicle. Once everything is lined up and pegged in tracks arms become intake vents/thrusters along the side of the vehicle, with his wings unfurling to provide a modest wingspan that we are expected to believe can make a Corvette fly. Aah the good old days of believing in cartoon physics. Small tail fins also pop out from the rear of the vehicle to complete the look and for attack mode you can clip a specialized black beam gun tip into the license plate slot on the front of the vehicle. There are 2 small tabs on one side of the gun that will slot in under the top lip of the connection point. 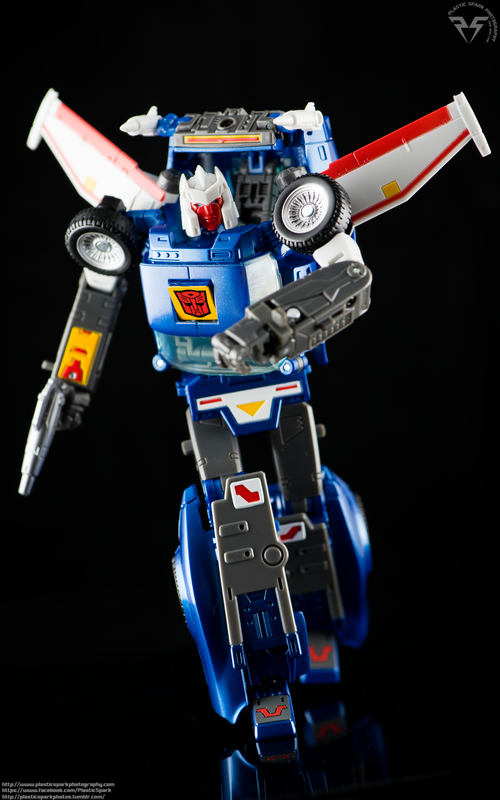 Tracks flight mode looks pretty great and while certainly not a believable flying machine he does look pretty accurate to his cartoon counterpart. The vents/thrusters that peg in to his sides sometimes sit at a bit of an angle and may require some fine tuning to get them in to the right position. Tracks has a peg on the underside of the rear of the vehicle that is exposed in this mode and allows you to plug in the flight stand that was included for dynamic flight poses. Robot mode is a bit more finicky than the alt mode. It’s a very good representation of Tracks’ cartoon model and he looks great in most basic poses. His white helmet and red face are quite remarkable though I never really felt that fondly about his all red face. While the colors are reproduced and applied cleanly I find it hides a lot of the details in the face sculpt. The transformation is a bit more complex than some of the other Autobot cars but it’s fairly intuitive and with the exception of a couple small pieces on the legs I think many could figure it out without instructions. On my copy the legs were stuck so tightly together that I thought I was going to break him and I had to look up a couple videos to be sure I wasn’t supposed to be disengaging something first. After the first separation the legs now peg and unpeg without much hassle. Be careful with the hood pieces as they are on fairly small hinges and their size causes a good amount of leverage, I would hate to hear of anyone breaking their figure in such a crucial spot. Once everything is clipped and pegged in properly Tracks holds together fairly well. There have been reports of his backpack being incredibly loose and coming undone all the time but that does not appear to be true with mine. I can pick mine up by the backpack and shake the energon out of him without it coming loose at all. There are some small tabs on the bottom of the backpack that tab in to his side abdomen area and the tabs are quite tight. They require a little bit of bending and pressing of the plastic to clip them in tightly. I can understand people feeling a bit hesitant to apply that kind of pressure to the thin plastic in that area but I feel that most of the people having issues with the backpack may not be actually clipping it in to the sides. The other main complaint I have heard is how his shoulders tab in. Now on this one I can sympathize with as the shoulders on mine do like to come un-tabbed pretty easily. It can be a bit of a pain when posing him. The main issue I end up with is the fact that his shoulder wheels do not clear his wings without bumping in to them, and the leverage usually causes the shoulder stocks to come disengaged from the front chest portion that locks them in place. The only real solution that I can find is just being careful when posing him and holding him with some pressure between the front and back of the chest to keep the shoulders sandwiched in. Articulation on Tracks is pretty good. I do feel he is a bit more limited than some of his previous MP car brethren but at the same time he has a few extra points of movement that some of the other cars can’t pull off. Let’s start with the not so great bits. He has very limited range of movement in his elbows and his knees, They are both single joint ratchets, which is already a weird new thing, and neither one can go a full 90 degrees let alone the 45 or more I like to see out of joints like that. This is probably my biggest disappointment with Tracks as his tall slender frame really feels like it should be able to pull off more dynamic poses than it can and I feel like some of the poses look a bit unnatural due to the inability to properly bend at his elbows. He’s got standard wrist rotation and the familiar MP style opening and closing fist. His wings will get in the way of almost any pose you want to do with his arms and will constantly cause the arms to come un-tabbed unless you are conscious of it. The wings can be repositioned and folded at the base to adjust the angle they are presented at but it’s the base of the wings that interferes with the shoulder and there’s not much to be done about that. His backpack sits a little high and makes for a bit of a gap in his body when viewing him from the side. While I don’t personally find this to be a big issue, it does look like there would be a natural way to compress the backpack a little more to fit tighter to his back. Though now that I think about it that would only exacerbate the issue with his wings and shoulders. Despite the less than excellent view from the side, Tracks looks great from the front and the backpack and missiles sit around the right height when viewed straight on. I feel the missiles could be larger but I understand the want for an all in one transformation so they made them a little smaller. Maybe some clip on larger missiles could be an option similar to how Prowl and the other Datsuns had replacement cannons to fit over their smaller shoulder launchers. He’s got a nice waist twist, thigh swivels, and despite his less than stellar knee joints his ankles have a very nice range of movement to allow for fairly extreme lower body posing. He can even lift up his own foot and look at the bottom of it. (I borrowed this from Emgo’s review, from his “Ew there’s gum on my foot” bit.) Unfortunately his limited knees don’t allow him to really take full use of his awesome ankles but he can still pull off some fairly dynamic posing. To be honest I find his limited elbows more of a hindrance than his semi limited lower body. Tracks comes with a number of fun little accessories that help to round out the package and add to your display options quite nicely. First and foremost are Tracks’ firearms. He comes with his signature Black Beam gun pistol, as well as a front mounted version of the weapon for his alt/flying mode. The pistol is fairly basic, painted in a nice shiny silver with some tech details to make it pop. The handle is made of a dark grey unpainted plastic and has the usual MP style tab to clip in to Tracks’ palm for posing. The alt mode gun is basically just a silver tapered barrel on a black piece of plastic that can fit in to the front grill of the alt mode. Tracks also comes with a small human figure of Raul from the G1 TV series, most notably appearing in one of Tracks’ starring episodes “Make Tracks”. The figure is a basic little statue with a base similar to old school army men toys and in true Takara fashion he is decently painted except for the completely blank face. I still to this day don’t understand the lack of face applications. They have shown they are able to paint and deco a smaller figure than this with the Brainmaster from MP Star Saber. It’s a fun addition but given its poor level of finish I honestly would have preferred a more valuable accessory like larger missiles or even a larger gun like his G1 toy had. Speaking of tiny paint applications, Tracks also comes with a miniature Blaster in his boom box mode. This little Blaster looks fantastic and he can be stored in tracks alt mode near the front of the cab (you have to choose between Blaster and Tracks’ pistol though) He is well detailed and even has a tiny little Autobot logo. 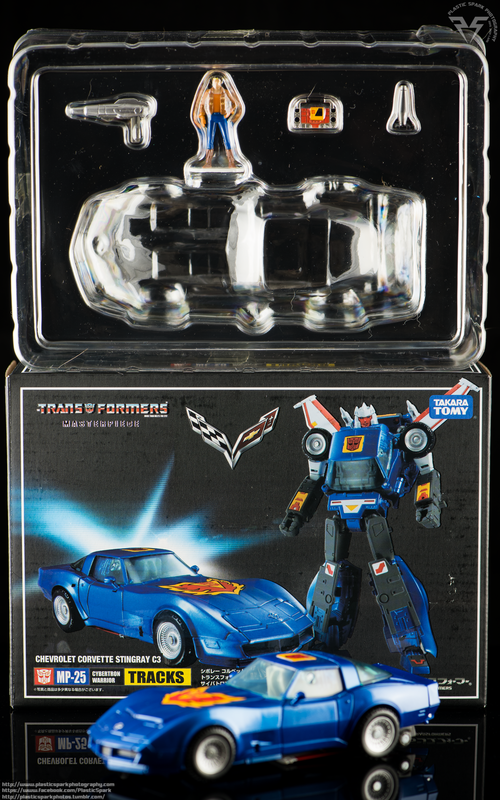 Literally in the exact same package as Raul we have an example of Takara’s ability to produce a fantastic looking tiny accessory with paint and tampographing yet we still have Raul looking like the damn Question from DC Comics. Takara also included an awesome flight stand for Tracks that can be used in both his flight mode and his robot mode for dynamic flying poses. The base is black glossy plastic with a nice clean Autobot logo and the arm has 3 points of articulation and holds its shape incredibly well. Attaching Tracks to the stand takes a little bit of force and I find the old “wiggle and push” method to work well rather than just trying to jam him on to the peg. Once he’s on the peg it takes a good amount of force to knock him off so you can adjust the stand and Tracks to your liking without too much concern. If you consider them accessories, Takara also included the usual instruction booklet with some extra info about previous Tracks iterations and the Trading card. Tracks has a very startling effect when looking at him. He stands out from a crowd of Autobots with ease and I have a feeling he would want it that way. His bold colors and deco details pop and his signature white helmet and red face are unmistakable. 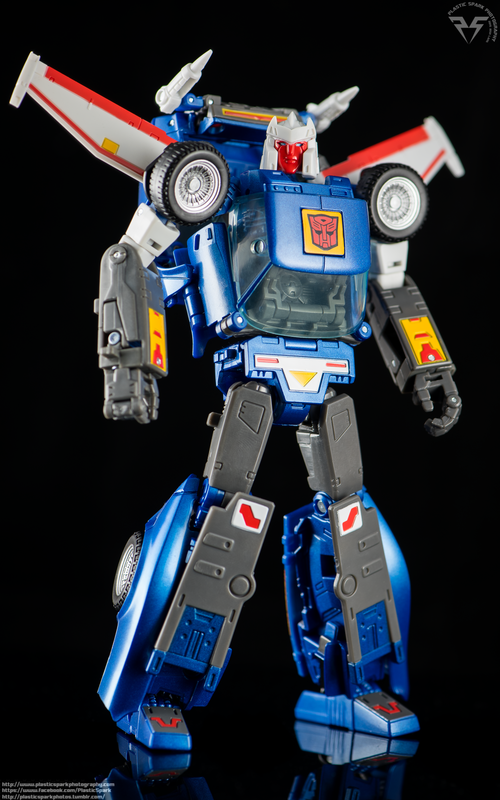 His alt-mode is fantastic and is probably my favorite of all the Takara Masterpiece figures I own. I feel like when it comes to looks Tracks is a winner, but his articulation could have used a little bit more R&D time. The disappointing range on his knees and elbows and the constant un-tabbing of his shoulders will certainly rub some people the wrong way and I don’t blame anyone for skipping this release given how strong previous entries in the line have been. My Masterpiece shelf is a home for my G1 cartoon memories to come to life and in that sense Tracks is still a worthwhile pickup and a welcome addition to my G1 Autobot team despite his very real flaws. I think he’s worth a pickup but I wouldn’t judge you for waiting for a sale or a cheap second hand pickup. Check out the full gallery below and let me know your thoughts down in the comments section!